Then there are other historian who believed that Olympic Games began at about 9th century B.C in Olympia. The belief is supported by the fact that many bronze tripods have been discovered there. The significant of this is that it is thought that these tripods were given out as prizes. The marathon is an important back drop to the modern day Olympics, but it wasn't until the Athens Olympics in 1896 that the event was first introduced. On this occasion, the distance of the event was set at 42.195 km. The marathon was introduced at these games to commemorate the run of Pheidippides, who ran from Marathon to Sparta to get help and deliver the news that the Persians had landed, and was actually a distances of 149 miles. The standardized distance of 26 miles 385 yards (42,195 km) was not established until 1908 at the Olympic Games in London where track and field history was being made. For the exact distance of the marathon race was the precise measurement between the start line (Windsor Castle) and the finish line (White City Stadium). 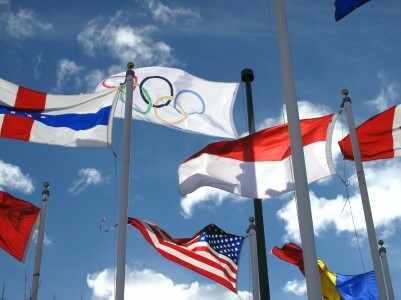 Ever since 776 B.C., the Olympics are held every 4 years in Olympia for about 12 hundred years. Slowly and steadily, more events were added until about 5th century B.C when the festival became a 5 day celebration. Incorporating events such as 3 foot races: dolichos, diaulos, and stadion as well as the pentathlon events as well: long jump, discus, wrestling, boxing, hoplitodromos, and pankration. The sport of track and field began in the United States during 1860’s. The first athletic group of the country (The Intercollegiate Association of Amateur Athletes in America) had the first competition in 1873. Following this in 1876 the United States held their first annual national championships. In 1880 England established the Amateur Athletic Association, and is still the governing body for track and field for that country. Track and field athletics was established as an amateur sport which mean that athletes could not be given cash prizes when they competed. If an athlete accepted financial compensation, they could be banned for life from the sport. For instance, in 1913, Jim Thrope having won an Olympic medal in 1912, found himself striped of his title because he also played semi-pro baseball. His title and medal was reinstated in 1982. Track and field events started to modernize in 1920’s. NCAA (National Collegiate Athletic Association) championships took place in 1921. Women’s track and field was included in Olympic Games in the year 1928. In those days, the United States and the Union of Soviet Socialist Republics (USSR) - both had strong teams. Track and field popularity boosted in 1970’s and ever since then, the Athletic Congress has been in command of United States events. For international competitions, it’s International Amateur Athletics (IAAF). From "Track and Field History" To "Faster, Stronger, Better – Your Shortcut To Improved Athletic Performance"
Learn more about Track and Field.